Context: Clinical studies about detailed spectrum of aspergillosis in treated tuberculosis (TB) patients are lacking. Hence, a study was undertaken at the Institute of Respiratory Disease, Jaipur, Rajasthan, India. Treated patients of pulmonary TB having any symptom such as hemoptysis, cough with expectoration, weight loss, and whose chest X-ray showed residual cavitation were enrolled for the study. Aims: This study aimed to determine the prevalence of pulmonary aspergillosis in treated cases of pulmonary TB and to study the social, demographical, and clinical characteristics of these patients. Settings and Design: A descriptive type of observational study was conducted at the Department of Respiratory Medicine in a tertiary care center of Rajasthan. Subjects and Methods: This descriptive type of observational study was conducted on seventy patients, whose sputum or bronchial wash showed isolation of Aspergillus. Demographic details, predisposing factors, and clinical findings were noted. Statistical Analysis Used: Data collected were entered into Excel spreadsheet and quantitative data were expressed as number and percentage. Results: The presentation of pulmonary aspergillosis in treated cases of pulmonary TB varies from aspergilloma (57%) to chronic necrotizing pulmonary aspergillosis (36%) to allergic bronchopulmonary aspergillosis (7%). The most common symptom was recurrent hemoptysis. Most of the patients were farmers by occupation, but no significant comorbid illness was seen. X-ray chest missed about 70% of cases. 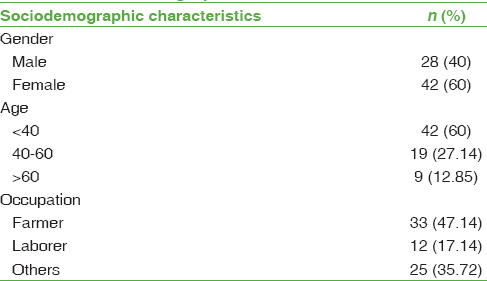 The most common species were Aspergillus fumigatus; others were Aspergillus terreus (13%), Aspergillus flavus (13%), and Aspergillus niger (7%). Conclusions: All treated cases of pulmonary TB presenting with recurrent hemoptysis and/or cough with expectoration should be evaluated in detail for pulmonary aspergillosis as chest X-ray alone can miss the diagnosis. Aspergillus is a ubiquitous saprophytic mold which includes 200 species., A concerning trend in the epidemiology of pulmonary fungal infection is the increasing incidence of patients in which traditional risk factors such as neutropenia are lacking. Aspergillus causes a variety of pulmonary diseases, mainly aspergilloma, chronic necrotizing pulmonary aspergillosis (CNPA), and allergic bronchopulmonary aspergillosis (ABPA) in the underlying chronic lung diseases., Further, clinical studies about the detailed spectrum of aspergillosis in treated tuberculosis (TB) patients are lacking in India. A study was, therefore, undertaken at the Institute of Respiratory Diseases, SMS Medical College, Jaipur, Rajasthan, India. The intake of patients for the study started in July 2016 and was completed in December 2017. After exclusion, a total of 110 treated pulmonary TB patients who presented symptomatically with sputum smear negative were examined, out of which 70 (63.6%) were found to have aspergillosis, thus included in the study. The mean age of the study patients was 42.8 ± 17.2 years. Females outnumbered males by a ratio of 3:2. By occupation, 33 patients were farmer and 12 were laborer [Table 1]. Hemoptysis (72.93%) of varying severity was the most common symptom, followed by wet cough (35.75%), chest pain (32.89%), weight loss (25.74%), dyspnea (20.02%), fever (20.02%), and dry cough (2.86%) [Table 2]. Comorbidities such as anemia, asthma, diabetes mellitus, and hypertension were present in 50%, 12.83%, 7.10%, and 7.10% of patients, respectively, and no comorbidities were found in 22.88% of patients. 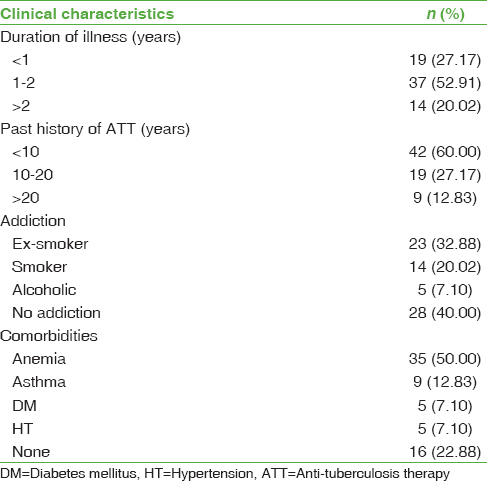 The duration of illness was <1 year, 1–2 years, and >2 years in 27.17%, 52.91%, and 20.02% of patients, respectively [Table 3]. Chest X-ray showed fibrocavitary disease (50%), aspergilloma (22.88%), bronchiectasis (20.02%), and patchy infiltrate (7.15%). 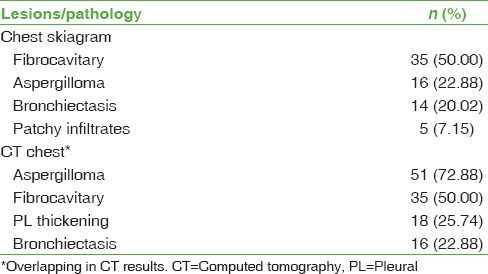 Computed tomography (CT) scan was suggestive of aspergilloma in 72.88% of patients, fibrocavitary disease in 50% of patients, pleural thickening in 25.74% of patients, and bronchiectasis in 22.88% of patients [Table 4]. Aspergillus fumigatus was the most common species isolated in 47 patients followed by Aspergillus terreus (9), Aspergillus flavus (9), and Aspergillus niger (5) [Table 5]. Aspergilloma was diagnosed in forty patients (57%) on the basis of Monad's sign and fungal culture. Thirty-five patients (36%) were diagnosed with CNPA on the basis of clinical, radiological, and microbiological criteria. Only five patients (7%) had ABPA without peripheral eosinophilia [Table 6]. Aspergillus species are commonly found in every region of the world. Aspergillus species are commonly found in soil and decaying vegetation. They can be found in household dust, building materials, ornamental plants, flower arrangements, tobacco, food, and water. Conditions enhancing dispersal of molds are activities such as construction, demolition, excavation, disturbance of dust accumulations during routine cleaning, water leaks, and moisture accumulation. Among them, twenty are pathogenic in humans. Aspergillus species release conidia at high concentrations (1–100 conidia/m3) that are small enough (2–3 μm) to reach the pulmonary alveoli and cause a variety of pulmonary diseases. The presentation of aspergillosis varies from aspergilloma, CNPA, to ABPA in treated pulmonary TB patients. Aspergilloma is characterized by classical radiological Monad's sign and positive Aspergillus precipitin test or sputum culture positive for Aspergillus or both. The demonstration of a mobile mass within a cavity on supine and prone scans is virtually diagnostic of aspergilloma. CNPA is diagnosed by chronic (>1 month) pulmonary or systemic symptoms including at least one of the following: weight loss, productive cough, hemoptysis with no overt immunocompromising conditions, and radiologically by cavitary pulmonary lesion with paracavitary infiltrates or new cavity formation or expansion of cavity size over time.,, The microbiological criteria included isolation of Aspergillus species from pulmonary or pleural cavity or positive serum Aspergillus precipitin test. ABPA is diagnosed by Rosenberg–Patterson criteria which included a history of asthma and immediate cutaneous hyperreactivity to Aspergillus antigens or elevated specific serum IgE and elevated total IgE (>1000 IU/ml) and raised A. fumigates-specific IgG or presence of serum precipitins. Although chest radiography is the initial examination of choice, in our study, it could show only 16 cases of aspergilloma. CT scan was found to be much more superior as it could pick 51 cases of aspergilloma out of the 70 patients. Furthermore, CT provided useful information regarding the extent of pulmonary disease and any associated pleural thickening. A limitation of our study was that anti-Aspergillus antibody was not done in all suspected patients. If that could have been included, probably the number of aspergillosis patients in treated pulmonary TB would have been higher. Tashiro T, Izumikawa K, Tashiro M, Takazono T, Morinaga Y, Yamamoto K, et al. Diagnostic significance of Aspergillus species isolated from respiratory samples in an adult pneumology ward. Med Mycol 2011;49:581-7. Kawamura S, Maesaki S, Tomono K, Tashiro T, Kohno S. Clinical evaluation of 61 patients with pulmonary aspergilloma. Intern Med 2000;39:209-12. Saeki A, Ogawa K, Honda K, Ando T, Oishi T, Sasamoto M, et al. Diagnosis of pulmonary aspergillosis in cases with cavity as sequela of tuberculosis. Kekkaku 1996;71:407-13. Binder RE, Faling LJ, Pugatch RD, Mahasaen C, Snider GL. Chronic necrotizing pulmonary aspergillosis: A discrete clinical entity. Medicine (Baltimore) 1982;61:109-24. Rosenberg M, Patterson R, Muintzer R, Cooper BJ, Roberts M, Harris KE. Clinical and immunological contains for diagnosis of ABPA. Am Thor Med 1977;86:405-10. Denning DW, Riniotis K, Dobrashian R, Sambatakou H. Chronic cavitary and fibrosing pulmonary and pleural aspergillosis: Case series, proposed nomenclature change, and review. Clin Infect Dis 2003;37 Suppl 3:S265-80. Beck-Sagué C, Jarvis WR. Secular trends in the epidemiology of nosocomial fungal infections in the United States, 1980-1990. National nosocomial infections surveillance system. J Infect Dis 1993;167:1247-51. Latgé JP. Aspergillus fumigatus and aspergillosis. Clin Microbiol Rev 1999;12:310-50. Golberg B. Radiological appearances in pulmonary aspergillosis. Clin Radiol 1962;13:106-14. British Thoracic and Tuberculosis Association Report. Aspergillus in persistent lung cavities after tuberculosis. Tubercle 1968;49:1-11. British Thoracic and Tuberculosis Association Report. Aspergilloma and residual tuberculosis cavities: The results of a resurvey. Tubercle 1970;51:227-45. Thompson BH, Stanford W, Galvin JR, Kurihara Y. Varied radiologic appearances of pulmonary aspergillosis. Radiographics 1995;15:1273-84.